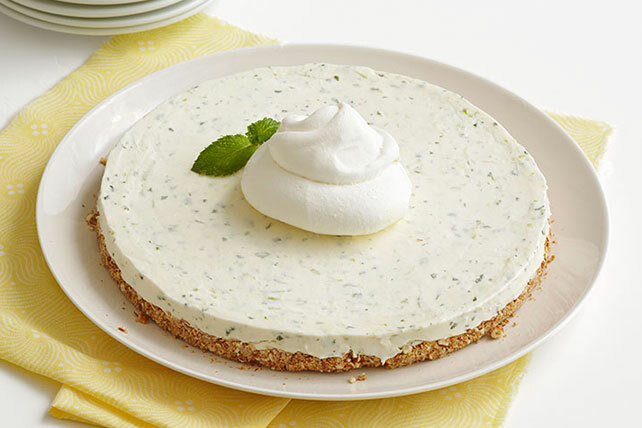 We've captured the fresh mint bite of a mojito in a frozen cheesecake with a pretzel crust. Speechless? We thought so. DOLE is a registered trademark of Dole Food Company, Inc. Mix pretzel crumbs and butter; press onto bottom of plastic wrap-lined 9-inch round pan. Freeze until ready to use. Beat cream cheese, sugar, lime zest, juice and mint in medium bowl with mixer until blended. Whisk in 1-1/2 cups COOL WHIP; spoon over crust. Freeze 4 hours or until firm. Serve topped with remaining COOL WHIP. Omit lime zest, juice and mint. Add 1 can (8 oz.) DOLE Crushed Pineapple in juice and 1/4 cup toasted BAKER'S ANGEL FLAKE Coconut to cream cheese mixture with the COOL WHIP. Garnish with additional coconut, if desired. Dessert can be stored in freezer up to 24 hours before serving.